Under the No Child Left Behind (NCLB) Act of 2001, all Local Education Agencies (LEAs) must maintain a plan approved by the state board of education that describes the implementation of No Child Left Behind and related “Title” programs. 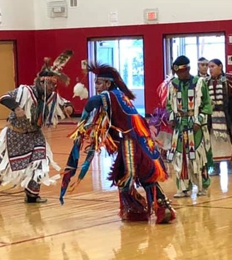 Visit the Bureau of Indian Education website to learn more about how we ensure each student’s right to an equitable education. Our special education program works with families to create Individualized Education Plans (IEPs) to meet the special needs of their children. This plan includes related services in and out of school, at no cost to the family, to complement the student’s personal instruction and ensure that he/she receives the most benefit from his/her education. Please visit our district Special Education page for more information. We understand the correlation between a healthy diet and academic performance. That’s why The St. Stephens Indian High School kitchen staff serves both breakfast and lunch daily. Please visit our district Food Services page to view menus and learn more about our breakfast and lunch program. St. Stephens Indian School District is pleased to provide bus transportation for all students enrolled in one of our schools. Students riding buses to and from school must observe the bus rules. Please visit the district Transportation page to view bus rules and route information. Please visit the BIE website to learn more about these Indian Education programs.